"It's a deadly game of 'tag' and Cary Grant is 'it'..."
Wrenching suspense and hair-raising thrills abound in this Alfred Hitchcock spy classic starring Cary Grant, Eva Marie Saint and James Mason. Through a misunderstanding successful but average advertising executive Roger Thornhill (Grant) is believed to be George Kaplan, a spy wanted by foreign counter spies. After being kidnapped and interrogated it is assumed that he is too hard to crack and is forcibly intoxicated and put behind the wheel. Recovering and finding that no one believes him he goes in search of the men who kidnapped him only to find a beautiful American spy (Saint) and a deadly spy ring. 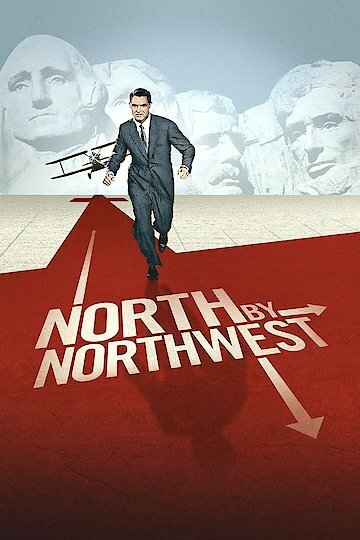 North by Northwest is currently available to watch and stream, buy on demand at Amazon, Vudu, Google Play, FandangoNow, iTunes, YouTube VOD online.